Whether you’re itching to work in the great outdoors or looking to mentor young minds at a variety of speciality camps, our camp counselor resume sample and writing tips are sure to get you in front of hiring mangers. Start your journey today by filling out our free, personalized resume builder. 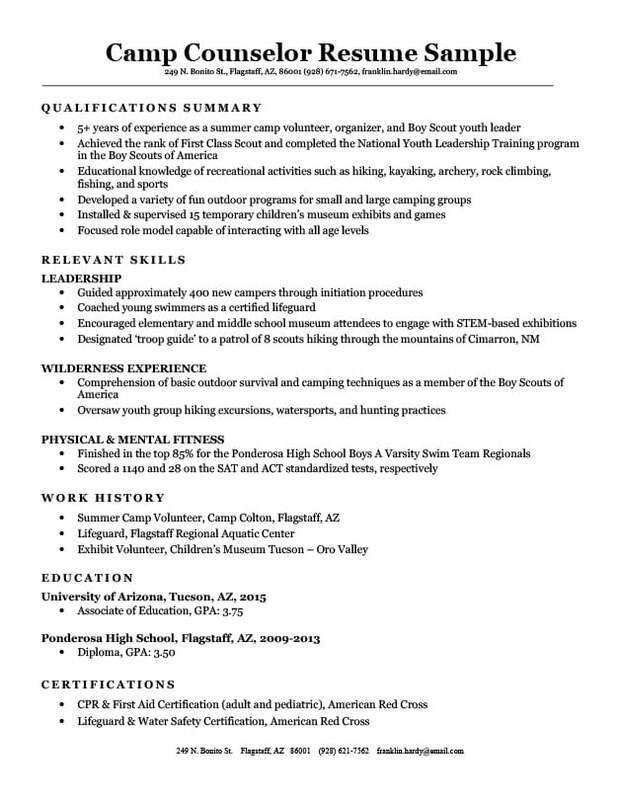 Customize your camp counselor resume. 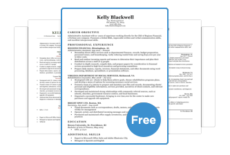 We have over 100 resume templates to choose from and download for free. If you’re curious about another career field altogether, we’ve conveniently sorted all of our resume examples by job & industry. Not sure how to go about writing the perfect cover letter? Check out our 45+ free cover letter examples and secure your dream job. Our resume writing tips are a surefire way to land a job. When you imagine camp you probably think of hiking out in the woods, sitting around a campfire, and roasting S’mores, right? Well, the typical vision of summer camp is increasingly changing. Newer types of camps (many of which are not exclusive to the summer season and take place throughout the year) offer a wide range of specialized activities for kids to enjoy. From computer programming, robotics, and science to music, performing arts, or sports camps – there are hundreds of camps out there that need enthusiastic counselors to oversee campers. 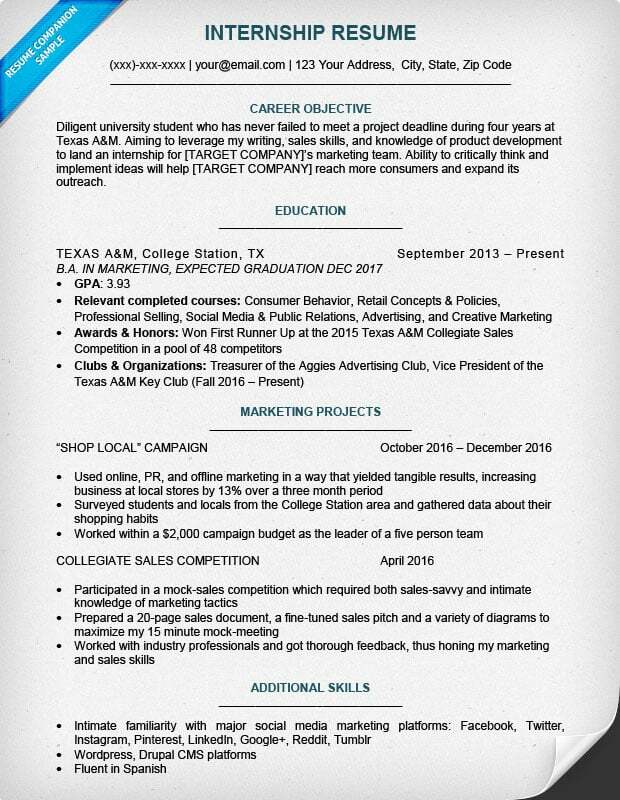 So, the best way to start off your resume is by introducing a summary of your qualifications. Typically, we avoid suggesting a qualifications summary for entry-level or intern/volunteer positions, but a camp counselor resume could be the exception to the rule. Counselors need to have a vast array of niche qualifications that may not be easily summarized in a career objective or exemplified in your work history. Generally, hiring managers for camps are looking to hire counselors that have some prior history in the camp’s focus. That means the very first thing you want to highlight are aspects of your background, accolades, and character that demonstrate why employing you is critical to their mission. If you’re applying to a traditional summer camp, demonstrate your knowledge of outdoor recreational activities or your time spent organizing a sporting tournament. Are you applying for a counselor position at a robotics sleep-away or faith-based retreat? Shine a light on your volunteer work at a children’s museum or a church event. Emphasize the occasions where you were involved in organizing and managing events for kids. If you’re a high school grad or college student applying for a counselor position, your work history is unlikely to impress. While delivering pizzas or ripping ticket stubs at the local movie theater help get your bills paid, they aren’t particularly relevant to your camp counselor resume. 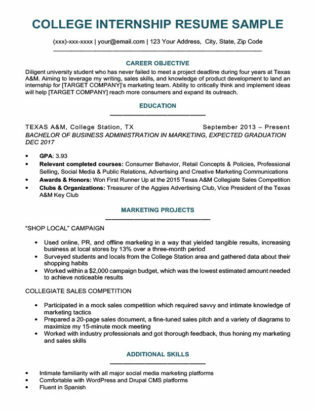 Utilizing our functional resume format is a great way to display your skills and accomplishments up front. The functional format allows you to represent all your relevant skills while relying less on grabbing a hiring manager’s attention with lists of the places where you’ve worked. The functional format allows you to represent all your relevant skills while relying less on…lists of the places where you’ve worked. A camp counselor needs to be an exceptional leader and guide. An employer wants to know they can count on you to lead with authority. When drafting your resume, highlight a time you took charge over a student or work project. Whether you’re applying to a traditional summer or specialty camp, hiring managers are looking for counselors that will be great role models to kids. Try and emphasize a time you volunteered with a youth group or taught an after-school program. This will show any employer that you’re prepared to interact with young children on a daily basis. If your previous work history is relevant to the camp counselor position, consider checking out our reverse-chronological resume format instead. As a camp counselor, the safety and security of young campers is the highest priority of you and your employer. You can stand out to hiring managers if you’re trained to respond to emergency health and safety scenarios. The American Red Cross is one of many instructors that offer a variety of classes (from CPR and First Aid to Lifeguarding and Water Safety) to attend and receive certification. Complete a training course one weekend and make yourself a more desirable candidate. Even if you’re not in a position to undertake a certification class, you can still highlight your health and safety experience. If you’re struggling with how to write a great skills section, we’ve got you covered. Check out our How to Write a Skills Section for a Resume page here. What are you waiting for? Begin your next adventure and try our free resume builder today.